Sarah - When we want to study our changing climate and how things might change in the future, we need to look at what has happened in the past. There are several methods that researchers use from ice cores to tree rings, but what if we want to look at more recent changes from the last couple of hundred years or so?Most of the methods aren't accurate enough for recent history, and some of the most recent data like the Keeling curve, measuring CO2 levels don't go back far enough. Now we have data from an unlikely source - the logs of whaling ships that used to set out into the Arctic waters in the 18th and 19th centuries. Dinah Molloy Thompson is from the Scott Polar Research Institute here in Cambridge and I caught up with her to find out more about these whaling logs. But to start off with, why were these ships going out to catch whales in the first place? Dinah explains. Dinah - Well, if you think about it there wasn't much in the way of oil, lighting was by tallow which is the fat of animals, and they discovered many, many centuries ago that oil from whales could be extremely valuable in all sorts of commodities, as pharmaceuticals, making butter, margarines if you like. And of course whaling began to provide Britain particularly with the raw materials for a whole industry that was building within the industrial revolution. These were extraordinarily brave men. They went up to the Arctic in clothing that we wouldn't even go for a Sunday walk in these days. No oil skins. And they braved their way up there, sometimes perhaps starting in March and wouldn't come back 'til August. And they were extraordinarily good sailors, much to the interest now, because people didn't understand that these people were such goo sailors. They had to bed to get there and back, to navigate their way there and back, and highly disciplined. So it was a completely different way of sea life. Sarah - I suppose now if we considered people who go out whaling it's very much from an environmental point of view and from a conservation and animal-lover point of view, the people who go out whaling are quite looked down upon and frowned upon. But back there was it that they were really well respected they were excellent seamen, they were so brave to be going out in these dangerous conditions, so what is seen as something that was seen as a very brave, impressive thing to go and do? Dinah - It was indeed. Within the local communities, say of Whitby or Hull, the whole community would be involved in it. In fact a boat would be owned maybe by 40-50 people which would provide the pensions for the widows. And the whalers and their children and their families were a major part of the community then.We have a completely different attitude towards animals now then we had then of course. According to one of the great whalers of the time MR William Scoresby, who became a clergyman at the end of his days and was a very religious man, he viewed the whales as being put their by god for the good of man not to be cruel to, but to be used for man. So, a completely different attitude. And of course the abundance of them was amazing and they didn't understand that what they were doing would diminish the population to below a critical mass which they couldn't recreate again. So nowadays of course we have a different attitude altogether. We have any don't need for whales apart from the pleasure of eating their flesh, which I must say is absolutely delightful, it's wonderful, it's like veal. But it's not what we do nowadays. So of course it's frowned upon. Helen - It's really interesting that we do have a very different attitude towards whales than we do towards anything else that lives in the oceans. The fact that we had this moratorium introduced recently, and that we're a long way off doing something like that for even really endangered species like bluefin tuna.Apparently back in the eighties, it was around the time we were discovering that whales have these amazing songs, and they're very intelligent, and I think that brought us much closer to whales. So I do think we have this pretty bad notion of someone who goes out and hunts whales, when it's just the same as anything else that lives in the sea really. Sarah - Dinah's point about how the whalers were a real central part of the community, these ships were owned by several families, it was a really important part of life back then. Things have really changed obviously that's not the view we have of people now. But how do we move from thinking about whales and whalers and why they were going out, to how on earth these logs that they were taking give us information about climate? Dinah - Well in their logs they wrote not just about the whales that they caught and who caught them and how they caught them, and so forth, they also of course recorded the wind directions and the wind strengths, but they would also record the weather conditions. So we would know roughly where they were, with the little matter of longitude which of course was a problem, but their latitude was good. So we had a good idea roughly from the log as to where they were, and how much ice was about them and what kind of ice was about them. Because they would describe it, they would say, there's streams of ice, thick ice, can't get through ice, ice floes, whatever it was, they would describe. And if you're looking at that over a period of about 100 years you can begin to map it - roughly - and roughly is sufficient if you're looking at climate rather than weather. Sarah - So why did they take such detailed logs? Dinah - First of all, the wind direction and wind speed were absolutely vital. It would be important for them because then they would know roughly what was happening to the weather conditions, and what to expect say further NE or wherever it was. And which way they could go, whether they could go up to a bay that they used the previous year that they got whales in, or they couldn't go. Because it was square rigged, so they're manoeuvrability was limited. They couldn't get as close to the wind, or anything like that. So they needed to know what the wind was doing. And as far as ice was concerned, they would put that down because they could see if there was a stream of ice coming down from the north they could interpret enough as to what might be happening further north of them, for example.Perhaps what was more important at the time, not so much about the content, but the fact that they actually have to do it, or did it, the government devised a scheme of what they described as Bounty. 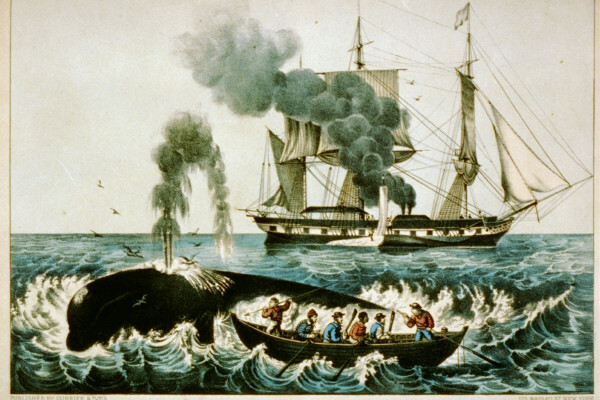 IN order to encourage the whaling industry, the whaling industry became very important, the commodities were important to industry, so they had to encourage it. And to encourage it they offered so many, for example at the height of it, it was 40 shillings per tonne, at the tonnage of a boat. A boat might be anything from 300-500 tonnes. And the idea was that that Bounty would help to reinforce the hull so that they could get through the ice. But when they came back to their home base, they had to show their log in order to receive their bounty. Now it wasn't based on the number of fish they'd caught, it was simply based on the fact that they had a log that conformed to what was required. Sarah - So much like the farming subsidies that we have today, the government actually supported the whaling industry. But if the whalers had to fill in their logs to get that bounty, you might perhaps think they might not be the most accurate guide to climate. So how do researchers like Dinah make sure that the log accounts of wind and ice and weather are accurate? Dinah - Of course you can never be sure of anything like that. But that was the most authentic information that you were going to have. Now there is a thing that you can do and that is to validate the information which in fact is what I was actually interested in doing. And if you get two boats together roughly in the same area, they'd see each other so there would be something in the log that said "saw Resolution from Whitby today". If you've got Resolution's log you can go there and it may say "saw Bounty from Hull today" then you know the two boats have seen each other. So then you begin to compare what they've written in their logs. And if they're completely different you begin to think, hmmm I wonder. But in fact they turn out to be sufficiently similar to say yes they are all doing the same thing. And also the terms that they used, when you convert the terms into say a numeric value you find that they are all saying, using the same terms, when they see the same thing, the same state of water, same state of wind. So, in fact I finished my thesis on this very issue about validating the dating so that we can know that what they say is sufficiently good to use for solid data. Sarah - And actually some even cooler cross-referencing that Dinah managed to do involved the readings in the logs about the state of the sky. In order to figure out where they were the whalers would take sextant readings using the sun. But if they couldn't see the sun they'd write something in the log like "sun obscured". And Dinah found there was actually a dip around 1816 where a lot of records contained the words "sun obscured" or "sun obscure". So she went off to her history books and found that they coincided with "the year without a summer", which is what 1816 was known as because it was caused by the 1815 eruption of the Tambora volcano, spewing these huge amounts of ash into the air and effecting world climate. So the records are actually pretty accurate. Helen - So how do we use these records once they've been found? Dinah - My role, I'm not a meteorologist, is to give back to the meteorologists and climatologists data that they can use backwards and forwards in their climate models, which will begin to show us the movement of weather systems, things like the North Atlantic Oscillation, which is quite important to us, which we think oscillates every 12 years, but we haven't got much data on that. But this will certainly bring an awful lot more data on the periodicity of that. What I'm trying to do is to prepare data which has validity which is understood. There is a lot more to be done. We've a lot more data to be found. We've just set up a new project which is being funded by Leverhulme, which is called Arc Doc, and it is going to try and find as many logs and possible particularly in the Arctic. And I'm hoping to extend the research so that we can not just get British whaling logs, but there's Norwegian, Dutch, Danish, a lot of American ones and get the images of them and digitise them, and extract the data so that we'll have a very large database of information available to mathematicians. These are terribly important when we are looking at our climate because all our climate ideas are extrapolated from earlier records. And while ice cores are interesting they don't give us the immediate information that we want. So the research will certainly last my lifetime, and more.